Formatting the SD card will wipe all the data on it. So make sure you've backed up everything off the card first. SD cards are an essential accessory for your GoPro. You're not going to get far without one.1 I've previously put together some recommendations on which SD card to get for specific GoPro models. Here I'm focusing on how to prep the card for use in the GoPro and how to keep its filesystem healthy and ready for use. Formatting the SD does two things. It wipes all the data off the card to free up space for new photos and videos. It also prepares the card to be the way the camera wants it, including the appropriate filesystem and folder structure. A kind of conditioning, if you like. Formatting is something you should do before you start using a card--and you'll get prompted by the camera to do it if the card isn't ready. And then you should also keep doing it routinely after that each time you've downloaded all the images and footage of the card. As a rule, it's best to format the card in the camera. That's true not just fo GoPros but for any camera. It is possible to format SD cards using a computer, and I have more details on that below, but it's good practice to always do it in the camera to minimize the risks of data corruption or some kind of formatting issue that could interfere with shooting. It's also worth doing regularly. That again maximizes the chance that the SD card's filesystem is healthy. I do it whenever I've finished downloading after a shoot. There are a few different ways that GoPros can format the card. The process does vary a little between models, but the general approach is the same. And on some GoPros you can choose among more than one way of doing it. Some GoPros, for instance, give you the option of using the menu on the touchscreen, the buttons and the front status screen, or the GoPro mobile app. On other GoPros, only one or two of those options are available. All of the GoPros that come with a built-in touchscreen have the formatting option as part of the menu system. The terminology isn't always exactly the same, but in general, you want to go into settings and find the option to refers to resetting the memory card. On GoPros with only a small screen on the front, such as the HERO4 Black and the HERO3 and HERO3+ models, you can use a combination of the power button on the side and the shutter button on the top to navigate through the menu system to the format SD card function. Some of the newer models, such as the HERO5 Black, HERO6 Black, HERO7 Black, or HERO (2018) also have a small front screen, but on those models, you can't access the settings menu with it--it's only for switching shooting modes. Press the power button a few times until you see a trashcan icon on the front screen. Press the shutter button to select that option. Press the power button until "ALL/Format" shows on the screen. Press the shutter button to select the "ALL/Format" function. Press the power button until "Yes" is highlighted. Press the shutter button to select "Yes." The camera then starts the formatting, and the camera's light and the trashcan icon on the screen will both start blinking to denote that the formatting is in process. The blinking will stop once the process is complete. 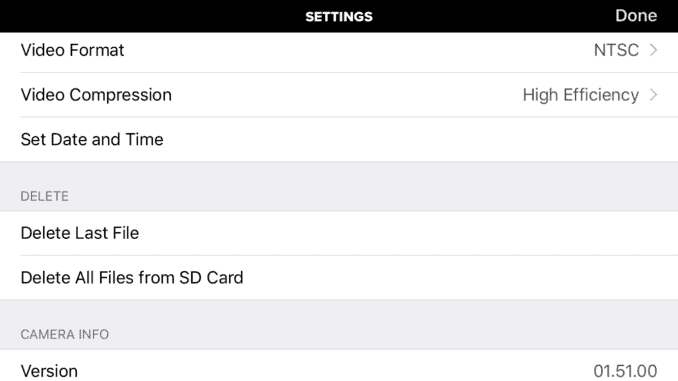 The GoPro mobile app also includes the function to format the SD card. Again, the terminology hasn't always been completely consistent between versions of the app, and it's not consistent between the camera's menu and the app's menu, but the current version of the GoPro app calls it "Delete All Files from SD Card". While it's best practice to format the SD card in the GoPro camera itself, it is possible to format it using a computer. There are a couple of main options and some things to watch out for. SD Card Formatter. The safest, most reliable, and simplest is to use the free app that the SD Association makes available specifically to set SD and microSD cards up to be fully compliant. It's called SD Card Formatter, and you can download for free directly from the SD Association's website. There's nothing complicated about using this app--the whole point is that it's a foolproof way to use the appropriate format for the type of card--but I've put together a more detailed walk-thru here. Operating System Disk Utilities. Another option is to use the operating system's built-in disk utility. With Windows 10, go to Control Panel > Administrative Tools > Computer Management > Disk Management. On Mac, use Disk Utility.